The Miami Dolphins' 2012 season is officially in the books, and amazingly the team remained in playoff contention heading into Week 16 despite finishing with a record of 7-9 for their fourth consecutive losing season. It certainly wasn't always pretty and the team's lack of talent at key positions—namely wide receiver and defensive end—combined with a rookie quarterback ended up dooming the Dolphins to their sixth losing season in the last seven years. While all fans whose teams don't earn a trip to the postseason tend to focus on the offseason, the stakes for the Dolphins probably could not be higher than they are in 2013. Widely-disliked general manager Jeff Ireland appears to be safe and heads into the offseason with over $40 million in cap space and a handful of high draft picks, making this a make-or-break offseason for the franchise's future. 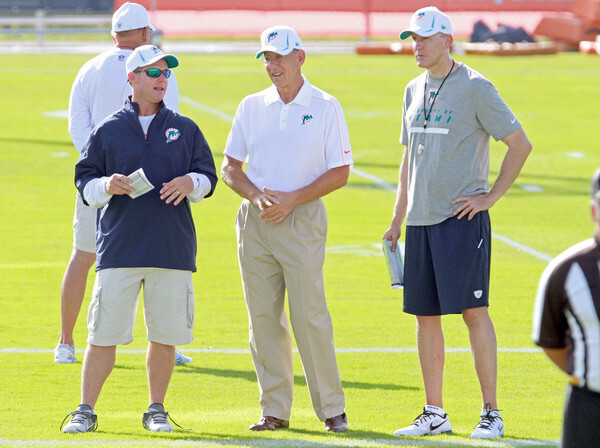 Unlike the 2012 offseason when the team was searching for a head coach and subsequently a large portion of new assistants, the Dolphins' coaching staff seems unlikely to undergo major changes in 2013. Joe Philbin's job is safe and I don't expect him to part ways with many members of his staff, is any at all. I don't see either offensive coordinator Mike Sherman or defensive coordinator Kevin Coyle generating interest in head coaching searches, while the Dolphins have a fairly young and inexperienced position coaching staff that probably won't garner NFL coordinator interest either. Exceptions to this could be defensive line coach Kacy Rodgers and linebackers coach George Edwards. Rodgers has consistently gotten great production out of his players in Miami and Dallas, while Edwards has previously been a defensive coordinator with the Redskins and Bills. Perhaps the best bet on the coaching staff to depart (and this is purely based on past trends) is assistant offensive line coach Chris Mosley. While perusing bios the other day, I noticed that Mosley has never had a coaching stint last more than one season. In nine years as a football coach at the pro and college levels, Mosley has been with eight different franchises/programs and has never worked under the same title for the same team in back-to-back years. I'm curious (and a bit worried) about whether or not Brian Gaine will be departing Miami in the near future. Gaine was promoted to assistant general manager in the offseason after 13 seasons in the NFL. He is highly-regarded in NFL ranks and interviewed for the Rams' vacant general manager job in 2012 that ultimately went to Les Snead. It appears general manager Jeff Ireland is indeed safe for another year, if Monday's reports are to be believed. This is obviously concerning to some given the bevvy of cap room and draft picks he will have at his disposal, but I guess we'll just have to hope for the best. At this pick, the Dolphins will have plenty of options in either drafting a player, trading up using their two second-round and two third-round picks, or trading down to stockpile even more picks. (We all know they have plenty of needs to fill.) The loss to the Patriots actually moved this pick up from No. 15 to No. 12, if you're looking for a silver lining to the 28-0 blowout. Assuming they to stand pat at No. 12, one has to assume they'll focus on a few key areas like wide receiver, offensive tackle, defensive end and cornerback. A playmaking receiver is a huge need for the Dolphins, making Cal's Keenan Allen and Tennessee's Justin Turner potential targets. You can also bet the team will look heavily at pass rushers like Georgia's Jarvis Jones, FSU's Bjoern Werner, Texas A&M's Damontre Moore, BYU's Ezekiel Ansah and LSU's Barkevious Mingo and Sam Montgomery. As always, the Dolphins will have three home games against AFC East rivals the Bills, Jets and Patriots. They'll also have three more games against those teams on the road. That gives you six games. The Dolphins will face the AFC North this season, hosting the Bengals and Ravens in Miami while playing road games against the Browns and Steelers. They'll also match up against the NFC South, playing at home against the Falcons and Panthers and on the road in New Orleans and Tampa Bay. That brings the total games to 14. Finally, the Dolphins' second-place finish in 2012 means will play games against the second-place teams from the AFC South and AFC West. That means another matchup with Andrew Luck and the Colts in Indianapolis and a game against the Chargers in Miami. Had the Dolphins lost and the Jets won in Week 17, Miami would have actually fallen to third place and these opponents would have changed to the Titans and Raiders. Overall, the Dolphins' 2013 opponents had a combined .524 winning percentage in 2012. The schedule will feature six games against 2012 playoff teams, which doesn't include clashes with formidable opponents like the Steelers and Saints. The end of the Dolphins' season also means that the contracts of their eight practice squad players will expire this week, making them all free agents. A large majority of practice squad players in the NFL sign future contracts with their same teams in the offseason. Such was the case for six of the Dolphins' eight practice squad players after the 2011 season, and two of those players—linebacker Jonathan Freeny and safety Anderson Russell—ended up seeing regular season game action for the Dolphins in 2012. OT Jeff Adams — An All-American left tackle from Columbia, Adams spent the last six weeks of the season on the practice squad. He could have a future as a reserve tackle. DT Chas Alecxih — Undrafted out of Pitt in 2012, Alecxih went to camp with the Dolphins and began the regular season as a free agent before joining the practice squad on Sept. 13. He's a likable guy but he seems like more of a camp body than anything else. OG Chandler Burden — A former college defensive lineman that converted to tackle at Kentucky, Burden began camp with the Titans before joining the Dolphins in August. He spent the entire season on the practice squad and I expect him to push for a backup spot in 2013 (see below). WR Jeff Fuller — Once regarded as a very draftable prospect, Fuller went undrafted in 2012 due to drop problems in college. He has size and experience with the Dolphins' offensive coordinator and quarterback at Texas A&M, but it's quite telling he didn't earn a promotion in 2012 given how weak the team was at receiver. Still, I expect him back to compete in 2013. OT Andrew McDonald — McDonald seemed like an unlikely bet to even make the practice squad, as he wasn't signed with the team's initial batch of rookie free agents and didn't sign util mid-May. Nevertheless, he's worked as a backup right tackle all 17 weeks in practice and seems likely to return. CB De'Andre Presley — Presley went to camp with the Chargers as an undrafted free agent from Appalachian State, converting to a full-time cornerback after also playing quarterback and receiver in college. The lone new face on the Dolphins' initial practice squad, he surprisingly earned a promotion to the practice squad in October and played in four games before being waived and re-added to the practice squad on Nov. 6. Presley is a good athlete with a bit of upside, so expect him in camp if another team doesn't sign him. CB Dion Turner — Turner went undrafted out of Southern Utah in 2012 and went to camp with the Packers. He failed to make an NFL practice squad until joining the Dolphins' in the last month of the season. WR Brian Tyms — Tyms was signed to the Dolphns' practice squad after Week 1, having spent training camp with the 49ers. He played just one year of high school football and wasn't overly-productive at Florida A&M, but he has raw tools and could come back in 2013. Of those players, I would assume most, if not all, will re-sign with the Dolphins shortly after their contracts expire. Turner may be the most unlikely, since he was the last addition to the practice squad on Dec. 19 and didn't have nearly as much time to impress the staff as the others. The best bet, in my view, is guard Chandler Burden, who saw a significant raise from the practice squad minimum salary ($96,900) to just under $273,000 during the season to keep him from being poached by another franchise. Burden was a late camp addition on Aug. 1 but the team clearly wants to keep him around. Officially eliminated from playoff contention in Week 16, the hopes for Miami Dolphins fans in the regular season finale were to improve to a .500 record on the season and to potentially damage the Patriots' playoff seeding a bit. Instead, the Dolphins were routed and shut out 28-0, marking their fourth straight losing season after a division title in 2008. Embarrassingly, it is the first time the franchise has had four consecutive losing seasons since the franchise first four seasons from 1966 to 1969. Be sure to keep checking back for all kinds of offseason news, notes and analysis. In the coming weeks I'll have articles on offseason tidbits, the team's upcoming free agents, Dolphins and league awards, and playoff picks. That will be followed by Senior Bowl analysis, free agency and draft coverage. This was not one of Ryan Tannehill's best came some of that blame falls on him. He got little help from his pass protection and receivers, but he also held onto the ball way too long instead of running, trying to draw a flag or throwing it away. 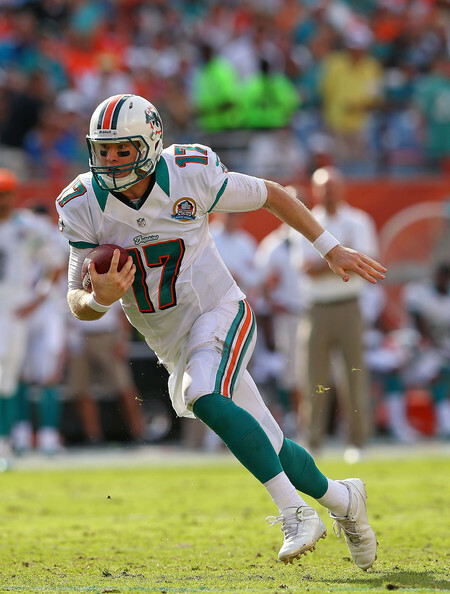 Tannehill has to be more aggressive and decisive if he's going to take the next step in 2013. Reggie Bush had little to work with and didn't do anything on the ground as the Dolphins were behind all game. Lamar Miller had a few nice runs just like he did a week ago, but he also made another mental error when he wasn't ready for a hand-off from Tannehill. That kind of stuff is reportedly why it took him so long to get on the field, so he really has to clamp down on that stuff. The receivers were pretty abysmal in this one. Aside from a few good plays by Brian Hartline and Rishard Matthews, the entire group failed to get open consistently and really let Tannehill down. Armon Binns had two bad drops, including a potential touchdown. I found it interesting that Marlon Moore pretty much saw no time on offense with Matthews and Binns, which says to me the team may not be interested in retaining the restricted free agent in the offseason. How sad is it that in a 28-0 loss in the season finale, in a game with Charles Clay on I.R. and Anthony Fasano knocked out, third-round rookie Michael Egnew still can't register a catch? Egnew finishes his rookie season with only two games played and zero receptions. He won't be on scholarship next year and he'll need an incredibly big turnaround to make the team again. It was an ugly day for the offensive line, in particular tackles Jonathan Martin and Nate Garner. They were routinely abused and didn't give Tannehill much time to throw. It's not a good note to end on for Martin, who projects as the full-time left tackle if Jake Long walks. Garner is a free agent as well, so the Dolphins could have multiple holes to fill on the offensive line. Cameron Wake did a great job sealing the edge in the running game and pursuing ball carriers, but he was shut out rushing the passer and the team as a whole failed to get to Brady at all except for one blindside sack from the secondary. I also felt the interior line struggled to stop the run and they looked like they were cold and didn't even want to be playing. It wasn't a pretty game for the linebackers, who were run all over and didn't make many player at the line of scrimmage. Kevin Burnett whiffed twice on the goal line and Karlos Dansby was his average self as well. I personally am hoping the team makes Dansby a roster casualty in the offseason. The team also struggled covering the slot and the tight ends as usual, leaving guys like Welker, Hernandez and Gronkowski open constantly. This wasn't helped by the lack of pass rush that allowed Brady to sit back and hit wide-open targets. It's pretty hard to judge the secondary in this one because they basically weren't challenged. Welker led the Patriots with eight tackles and obviously he lines up in the slot, but the other Patriots' receivers combined for just two total catches. Brandon Fields with the NFL lead in punting average at 50.2 yards, but he had a rough day in this one with a couple short kicks taken by the wind. That, of course, doesn't change the fact that he's a beast. With slot receiver Davone Bess already ruled out for Sunday's season finale against the New England Patriots, it is believed undrafted rookie receiver Brian Tyms may be promoted to the active roster to replace him. Tyms confirmed via Twitter Saturday that he did travel with the team to New England, although there has been no confirmation as a roster move yet. Still, it seems likely a move will take place as there is simply no reason to keep Bess on the 53-man roster if he's not going to play in Week 17. Bess will miss his third consecutive game with a back injury after playing in the first 77 games of his career since signing as an undrafted rookie in 2008. He finishes the 2012 season with 61 receptions, a career-low one touchdown but a career-high 12.8 receiving average and the second-highest yardage total of his career at 778. As for Tyms, it remains to be seen whether or not he'll dress and play in the season finale on Sunday. It's a possibility considering Brian Hartline (back) and Armon Binns (groin) are nursing injuries, although teams often promote guys late in the season not with the intention of immediately replacing them but simply getting a head start on re-signing them for the following offseason. If Tyms does play, he'll No. 85 and will likely work exclusively on special teams. The undrafted rookie was initially signed by the 49ers before being waived during final cuts. He was added to the Dolphins' practice squad after the season opener, where he has spent the past 15 weeks. Earning a promotion now would be an incredible accomplishment for a guy that played just one season of high school football, walked on to Florida A&M, wasn't one of the team's top two receivers as a senior and went undrafted. You can read more about Tyms' long journey to the NFL here, which makes for an interesting read despite the piece's author. My one other thought about a Tyms promotion doesn't relate to Tyms himself, but to the Dolphins' other practice squad receiver in Jeff Fuller. If Tyms is indeed getting a promotion this Sunday, it speaks volumes about Fuller that he's still on the practice squad. Unlike Tyms, the undrafted Fuller had plenty of experience at a top college program and was once considered a very draftable prospect before drop issues crept in. Fuller should also have numerous advantages over Tyms, having been with the Dolphins through offseason workouts and training camp and having a prior relationship with offensive coordinator Mike Sherman and quarterback Ryan Tannehill at Texas A&M. Combine all that with the fact that Miami's receiving corps has seen quite a bit of turnover this season and is currently even thinner than before when it was regarded as one of the worst in the league. For Fuller to have not earned a promotion yet, and to not earn would over Tyms here, could be quite telling about Fuller's future prospects. I would still guess Fuller earns a future deal with the Dolphins next week and returns for training camp in 2013, but it's clear he's a long way from contributing in the NFL and I wouldn't hold my breath that he'll soon be reliving his college glory days with his old quarterback. It was a disappointing Wednesday in terms of individual Dolphins accolades, as defensive end Cameron Wake was Miami's only player voted to the AFC Pro Bowl roster in 2012. Wake, who was certainly deserving of his selection after terrorizing opposing quarterbacks to the tune of 15 sacks this season, earned his second career trip to the Pro Bowl while others like punter Brandon Fields, safety Reshad Jones and Mike Pouncey were snubbed. However, because many players selected end up dropping out of the game due to injury or their team's participation in the Super Bowl a week later, a number of Dolphins have a chance to be added to the AFC roster at a future date after being named alternates on Thursday. Obvious snubs like Fields and Pouncey are among the Dolphins' seven Pro Bowl alternates. They are joined by running back Reggie Bush, wide receiver Brian Hartline, guard Richie Incognito and defensive tackles Paul Soliai and Randy Starks. Of the seven, only Soliai and Starks have ever earned previous Pro Bowl acknowledgement. Soliai is an alternate for the second straight season after earning his first nod in 2011, while Starks was selected to the Pro Bowl after the 2010 season. It's safe to say most of these players are certainly worthy alternates. Fields won the fan vote this year and leads the AFC in gross average (50.3), while Pouncey has easily established himself one of the NFL's top centers. Meanwhile, Bush is closing in on his second straight 1,000-yard season and Hartline reached the 1,000-yard plateau for the first time in his career in Week 15. I'd say just about the only guy I don't agree with being an alternate here is Incognito, who has graded out positively this season but overall has been far too inconsistent to be in the Pro Bowl discussion. The most perplexing name missing from the Dolphins' alternates list is safety Reshad Jones, who had a strong argument for a starting spot and certainly out-performed selected strong safeties Eric Berry (Chiefs) and LaRon Landry (Jets) this season. For Jones to not even be on the alternates list is just laughable and downright wrong. I'm also surprised to see no mention of rookie returner Marcus Thigpen, who is one of only three players in the NFL this season with touchdown returns on both a kickoff and a punt and ranks in the top three in the NFL in kickoff and punt return averages. 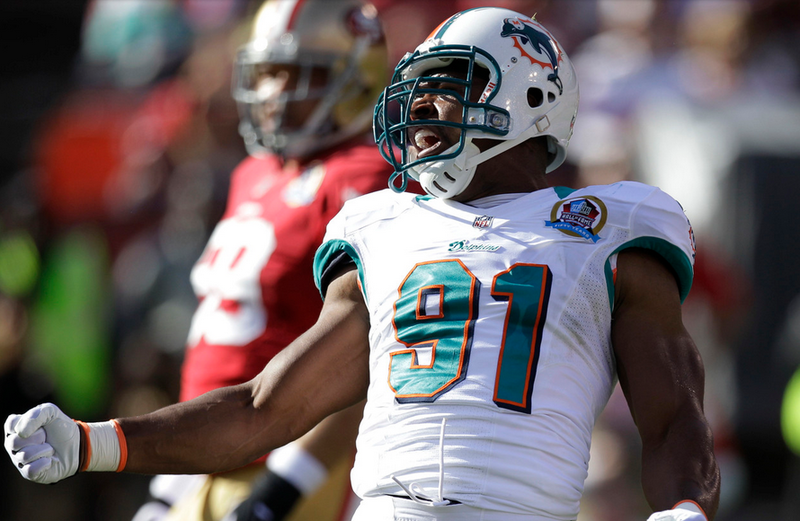 As expected, Miami Dolphins defensive end Cameron Wake was selected to the AFC's 2013 Pro Bowl roster, earning his second career selection after posting 15 sacks and three forced fumbles with one game left to play in the regular season. Wake's story continues to be an incredible one, going from an undrafted free agent from Penn State in 2005 to a star in the CFL to a two-time Pro Bowler with the Dolphins. Wake was a huge bargain on the four-year, $4.9 million contract he signed with Miami in 2009 and now has 43 sacks in 61 career games, placing him fifth on the team's all-time list and within striking distance of second place (Jeff Cross, 59.5). Unfortunately, Wake will be traveling from Miami to Honolulu solo as he was the only Dolphins player voted to this year's squad. The chance remains that additional players could be added as substitutes or alternates. Punter Brandon Fields did not make the Pro Bowl despite winning the fan vote (which makes up one third of the voting), while center Mike Pouncey, safety Reshad Jones and return specialist Marcus Thigpen failed to earn their first selections as well. Despite taking a backseat to Fields in both gross and net average (Fields leads the AFC in gross average), Colquitt has a strong argument for his selection with 17 downed punts and 43 punts inside the 20 (both lead AFC). The real snubs here are Pouncey and Jones, who are absolutely deserving of selections but lose out in a couple of popularity contests. Pouncey misses out in the selection to twin brother Maurkice Pouncey of the Steelers and Chris Myers of the Texans, despite having a better season than either of them. Easily one of the best draft picks of the Jeff Ireland era, 2010 fifth-rounder Jones is coming off a Week 16 performance that saw him rack up two fumble recoveries and an interception, bringing his 2012 stat line to an impressive 86 tackles, one sack, two forced fumbles, two fumble recoveries and four interceptions. And not only is it a joke that Jones was snubbed, but it's even more ridiculous that he was snubbed by two guys (the Chiefs' Eric Berry and the Jets' LaRon Landry) that have been mediocre at best this season. There are a few guys that should be in the discussion with Jones (namely Eric Weddle and Jairus Byrd) but Jones should be right near the top of the list and Berry/Landry have no business near it. Finally, rookie returner Marcus Thigpen, who followed Wake's path from the CFL to Miami this season, lost out to the Ravens' Jacoby Jones for a Pro Bowl nod. Thigpen tied for second in the league behind Jones in kickoff return average (min. 30 returns) at 28.5 yards and third in the NFL in punt return average (min. 28 returns) at 12.1 yards. Thigpen was one of only three players in the NFL this season with returned touchdowns on a kickoff and a punt, though Jones as the only player in the league with three total return touchdowns. While the 7-8 Dolphins certainly have more to worry about that individual accolades, sending only player to the Pro Bowl in 2012 is a bit disappointing. Even the 2-13 Chiefs sent a whopping five players to Honolulu this season and there are certainly some strong cases that Wake should be accompanied by more than one teammate. 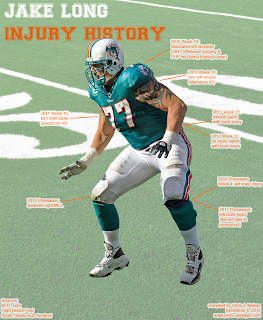 Last season, the Dolphins sent offensive tackle Jake Long as a starter and wide receiver Brandon Marshall as a reserve, while also adding defensive tackle Paul Soliai as an alternate. Long, who was selected to the Pro Bowl each of his first four seasons, concluded a down 2012 season by landing on injured reserve with a triceps injury in early December. 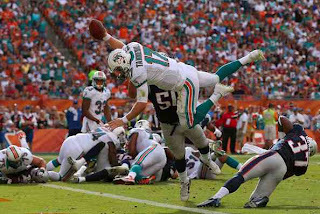 The Miami Dolphins rolled for their second straight victory in Week 16, earning a 24-10 victory over the Buffalo Bills. Unfortunately, the team was also eliminated from playoff contention with the Steelers' loss to the Bengals, but it's not like many were expecting a postseason berth anyway. I'm going to get into some very brief observations on this Christmas Eve, although who knows how brief they'l actually be considering how long-winded I am. One more note is that the Dolphins-Patriots game in Week 17 has been moved from 1 p.m. ET to 4:25 p.m. ET, so as to make the late games actually mean something to the playoff picture. Not the prettiest day for Ryan Tannehill's completion percentage, but he made some nice throws including a beautiful fade to Reggie Bush. He was pretty off at times, however, and missed a lot of throws that sailed high or wide. Bush had a nice game, running well and catching the ball in space. (Who would've thought that'd be a good idea?) I was also very impressed with rookie Lamar Miller, who ran hard inside and looked extremely impressive. Armon Binns led the team's receivers with three catches and rookie Rishard Matthews led them with 37 yards. Needless to say, it was a weak day for the weak receiving corps and the team needs a star here in the worst way. I will admit though, I am interested in seeing Binns in camp next year. The offensive line allowed two sacks, although one was really on Tannehill stepping into it. 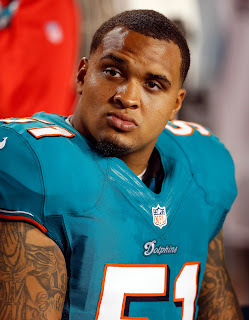 The other was allowed by Richie Incognito, who was either badly beaten or looking for a chip from Mike Pouncey. Overall though, I thought the protection was good and the run blocking opened up some nice holes as well. I continue to be amazed by Pouncey's speed and athleticism blocking downfield. 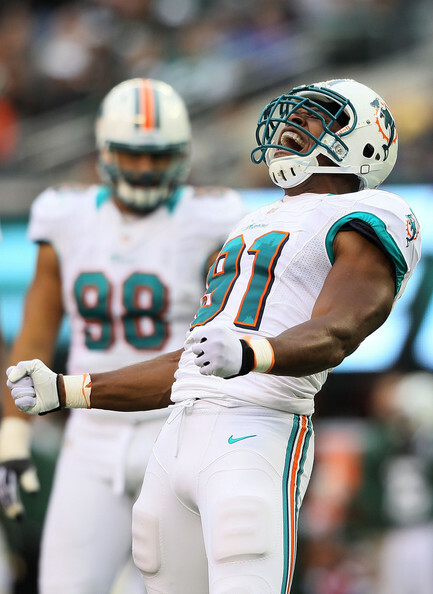 Another great day for Cameron Wake, who had a sack and a forced fumble in addition to plenty of other pressure. Olivier Vernon also had a nice game and I give him a ton of credit for chasing down and slowing up C. J. Spiller on a run that should have been a touchdown. As much as I hate the guy, I will say that Karlos Dansby is playing a lot better lately. Kevin Burnett has easily been the best and most consistent of the team's linebackers, though. And I swear Jason Trusnik was invisible yesterday as I don't even remember seeing him replacing Koa Misi. In a battle to fill Nolan Carroll's spot, I thought the newly-acquired Dimitri Patterson showed better than Bryan McCann. Patterson played well despite not joining the team until Wednesday, while McCann seemed to allow everything thrown his way to be completed. I expect both to return in 2013 to compete, with the well-paid Patterson serving as insurance in case Sean Smith walks in free agency. Chris Clemons had a good day at the office, but Reshad Jones stole the show once again with two fumble recoveries and a beautiful late interception on the goal line. He whiffed on a couple tackles that he should have made, but overall he's having a great season and has really made a strong case for a Pro Bowl selection. Nate Kaeding only had four kicks blocked in nine seasons in San Diego, but it only took one game to have his first kick blocked as a member of the Dolphins. Richie Incognito got dominated on the play and allowed the block. Kaeding, meanwhile, drilled his other attempt and filled in nicely for Dan Carpenter. New Miami Dolphins logo leaked? The folks over at DolFansNYC.com had been hinting for a while now on Twitter about having seen the new Miami Dolphins logo that is to arrive before the 2013 season. Sunday night, that site posted a photo of what they believe is (or is close to) the new logo. Head on over to DolFansNYC.com to read the full story about how they came across this logo. While they make it clear they don't know for sure the logo will be exactly what they say, they do say that they are "...95% sure the Dolphins new logo is going to look a lot like the photo..."
The Dolphins' new logo will mark the fifth time the team has changed its primary logo. Their inaugural logo was used from 1966 to 1973 and featured a smaller dolphin whose head was inside the sun. The second logo, which didn't change much from the first, featured a larger dolphin placed over the entire sun and was used from 1974 to the late 1980s. The third logo darkened both the aqua and orange colors, changed the font of the 'M' on the helmet and tilted the dolphin's head downward. In 1997, the Dolphins updated their logo to a more contemporary look, adding a navy accent color and giving the Dolphin more of a "face." Personally, I don't have any troubles with the logo. And this is coming from a guy that will now have a "retro" tattoo on his upper left arm. But in general I think it's as good if not better to the one the Dolphins are currently using. I like ditching the dolphin's face and the helmet, giving it a more natural and simplistic look. I also like the alternating small and large rays of the sun, which is a nice new feature. Some have complained that the new logo looks too much of a whale, I think it's pretty clearly a dolphin and people are just overreacting about the upturned tail. It's definitely an interesting change, going from a dolphin that's leaping into the air to one that appears to be swimming. But I think it's sleek and a nice change. What do you think about this potential new logo? Discuss in the comments or on the Facebook group, or tell me what you think on twitter! The Miami Dolphins placed their third player of the week on injured reserve Friday, shutting down placekicker Dan Carpenter with a lingering groin injury. 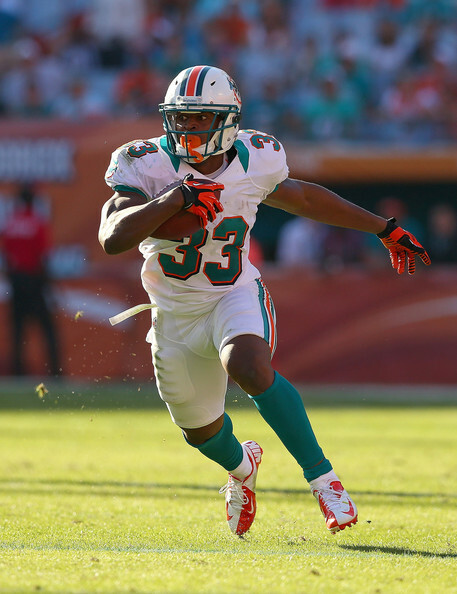 The team already placed running back Daniel Thomas and Charles Clay on I.R. earlier this week with knee injuries. Carpenter, who also battled groin injuries last season, appeared to tweak something on a kickoff early in Week 15 against the Jaguars but still managed a perfect 3-for-3 day on field goals, including a 53-yarder. He struggled with some late-game misses early in the season but has since rebounded, missing only one kick after Week 4. To replace Carpenter, the Dolphins have signed two-time Pro Bowl kicker Nate Kaeding, presumably to a one-year deal. A two-time Pro Bowler, Kaeding was released by the San Diego Chargers on Oct. 30 and departed as the most accurate kicker in NFL history. An Iowa City native, Kaeding played college football at the University of Iowa from 2000 to 2003, where he became the Hawkeyes' all-time leading scorer and won the Lou Groza Award in 2002 as the nation's top kicker. Drafted by the San Diego Chargers in the third round of the 2004 NFL Draft, Kaeding converted 80 percent of his field goals as a rookie before kicking 87.5 percent and 89.7 percent in the next two seasons while earning a Pro Bowl selection in 2006. In 2008, Kaeding kicked the final five games of the season with a fractured fibula. 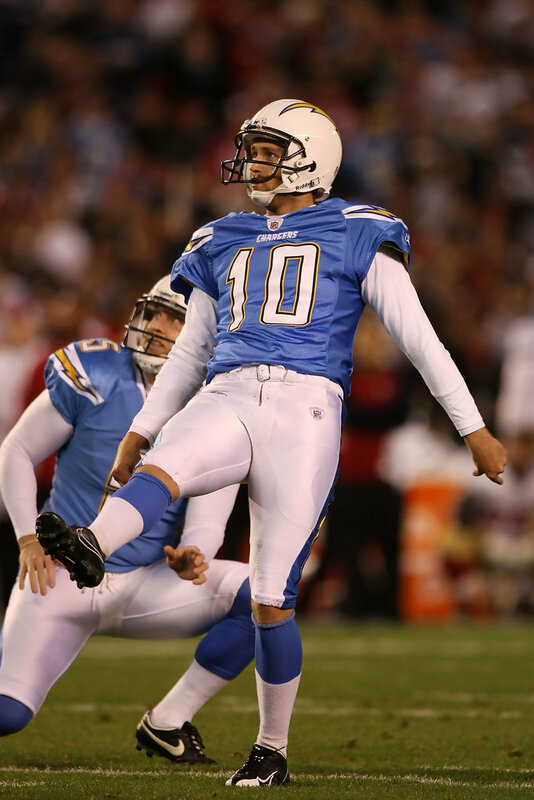 He set a career high with a 57-yard field goal in 2008 and in 2009 led the NFL in field goal percentage (91.4) on his way to his second Pro Bowl selection. Kaeding suffered a torn ACL on the opening kickoff of the 2011 season and missed the rest of the year on injured reserve. He returned in 2012 to win back his job and convert his first seven field goal attempts of the season. However, a minor groin injury saw the team place him on I.R. and he was released by the team on Oct. 30. Despite being the most accurate kicker in NFL history (87 percent) and never having a season under 80 percent, Kaeding's career has had its downs as well. Kaeding has converted just eight of 15 career field goal attempts in the playoffs (53.3 percent), including an 0-for-3 game in the Divisional Round in 2009 that the Jets won 17-14. It's surprising that Dan Carpenter was shut down, considering he seemed to be fine after tweaking something against the Jaguars. However, he was limited in practice this week and perhaps the Dolphins thought it'd be safer to bring in a fresh leg for the final two weeks of the season. It's fair to wonder if we've seen the last of Carpenter in a Dolphins uniform, or at the very least if he'll face competition in training camp next season. Carpenter rebounded from his early-season struggles in 2012 and has been extremely reliable for much of his career, but he's entering the final year of his contract extension signed in 2010 and is owed a hefty $2.675 million base salary in 2013. That being said, competition would typically come from a younger source and the 30-year-old Kaeding may simple be a two-week fill-in here. However, it's possible he could earn a contract offer in the offseason if he impresses the team over the next two weeks. In the short-term, there isn't much to worry about with this signing and Kaeding should be fine for the Dolphins. He'll obviously be adjusting to a new long snapper (John Denney) and holder (Brandon Fields), but he has long been one of the best kickers in the league and is extremely reliable (at least in the regular season) when healthy. With only two weeks left in the regular season (gotta be specific with the Dolphins still mathematically alive and all! ), minor injuries can land you on injured reserve. Such is the case for running back Daniel Thomas, who was deactivated for the remainder of the season Wednesday with a knee injury suffered in Week 15's win over the Jacksonville Jaguars. The team's second-round pick in 2011, Thomas finishes his sophomore campaign with 325 yards and four touchdowns on a 3.6-yard average. He suffered two concussions early in the season that forced him to miss time and lost two fumbles on the season, though he fumbled only once after Week 3. Rookie fourth-rounder Lamar Miller will step in as the team's primary backup to starter Reggie Bush, and it seems likely he'll get an extended look over the next two weeks with Bush's contract up in the offseason. Miller has bounced between the active and inactive list this season, rushing for 164 yards on a 4.6-yard average in 11 games. Taking Thomas' spot on the 53-man roster is cornerback Julian Posey, who was promoted from the practice squad Wednesday. An undrafted rookie out of Ohio in 2011, Posey was signed to the practice squad on Oct. 3 and earned the call-up over fellow cornerback De'Andre Presley. Posey, who spent part of his rookie season on the practice squad of the New York Jets, will be making his NFL regular season debut if he is active at some point over the next two weeks. He would likely be limited to special teams if he sees the field and probably falls behind newly-acquired veteran Dimitri Patterson on the depth chart. The Dolphins also signed undrafted rookie corner Dion Turner to the practice squad to fill the void left by Posey's promotion. The 5-foot-11, 194-pound Southern Utah alum spent training camp with the Green Bay Packers and will use his time in Miami to try and earn a future contract for a chance to compete for a job next season. With cornerback Nolan Carroll's availability for the team's final two games of the regular season in doubt due to a right knee injury suffered in Week 15 against the Jacksonville Jaguars, the Miami Dolphins picked up some insurance Tuesday but claiming veteran corner Dimitri Patterson off waivers. The 29-year-old Patterson was let go by the Cleveland Browns on Monday despite being just nine months into a three-year, $16 million contract signed in the offseason. Patterson will make $347,000 from the Dolphins over the final two weeks of the season. He also has base salaries of $4.5 million in 2013 and $5.3 million in 2014. Patterson takes the roster spot of H-back Charles Clay, who suffered a torn knee ligament this past Sunday and was reported as being out for the season yesterday. The team did not make any other roster moves Tuesday. An Miami, Fla. native who played high school ball in Orlando, Patterson played college football at Southeast Missouri State and Tuskegee, where he was a first-team all-conference pick as a senior. After going undrafted in the 2005 NFL Draft, Patterson spent most of his rookie season on the practice squad of the Washington Redskins. A late-season promotion to the active roster allowed Patterson to play in three games that season and he made his first career interception off Drew Bledsoe of the Dallas Cowboys. Patterson was waived by the Redskins during final cuts in 2006 and spent the entire regular season on the Minnesota Vikings' practice squad. He spent the next two seasons with the Kansas City Chiefs, totaling 21 special teams tackles in 20 contests. The Chiefs waived Patterson in November 2008. After signing with the Philadelphia Eagles in the 2009 offseason, Patterson saw his most extensive action to-date with 11 games played that first season and all 16 games played in 2010. He started the final nine regular season games for the Eagles at cornerback, as well as their Wild Card Playoff game against the Green Bay Packers, and totaled a career-high four interceptions on the season. Patterson was signed by the Cleveland Browns as a free agent in August 2011. He worked his way into the team's nickel job and earned positive marks from Pro Football Focus, playing 558 defensive snaps and recording 28 tackles and 12 pass deflections. 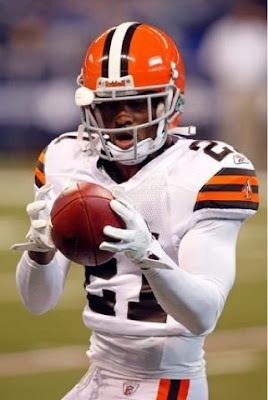 Patterson once against served as the Browns nickel corner for part of the 2012 season, although an ankle injury forced him to miss Weeks 6 through 13. He returned in Week 14 and played in the last two contests, playing a total of 61 snaps, before being waived on Monday. Patterson brings with him 71 regular games of experience, including 14 starts. He has excelled at times as a nickel corner and at the very least is a capable reserve player in the secondary, as well as a quality special teams player. Although there isn't much to get excited about with Patterson's arrival and there's a possibility he doesn't contribute much between now and the end of the season (I personally would rather see more of what Bryan McCann and R. J. Stanford can do), I'd be careful to not brush this off as simply a roster shuffling like the team has done with other corners this season. The fact that the Dolphins are willing to pay Patterson more than $340,000 for the next two weeks says to me they are interested in his services beyond the season. As previously stated, Patterson is signed (and signed rather handsomely for a nick corner) for the next two seasons at $4.5 million in 2013 and $5.3 million in 2014. While not a true starting-caliber player and someone that has probably peaked nearing age 30, Patterson provides the Dolphins some insurance depth with Richard Marshall coming off a back injury and disappointing No. 1 corner Sean Smith set to hit the open market in the offseason. 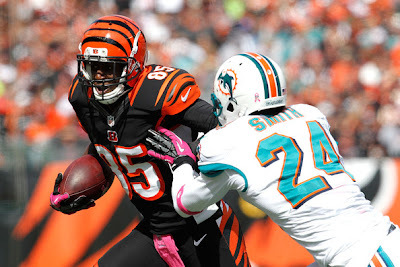 Smith started the season well as the Dolphins' top corner following the preseason trade of Vontae Davis, but he seems to have lost confidence and has certainly had a rough couple months. He could possibly be retained with the franchise tag or via an extension, but I wouldn't expect Miami to overpay and he might be greeted by a favorable market as a young, 6-foot-3 corner with plenty of starting experience. Patterson's acquisition doesn't come close to solving the Dolphins' secondary issues, but it does provide them with insurance and depth heading in 2013. His salary isn't guaranteed unless he's on the Week 1 roster next year, but I'd be surprised if the Dolphins at least didn't keep him around through camp and the preseason and let him try to earn a job. 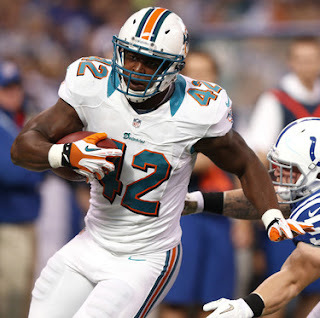 Miami Dolphins H-back Charles Clay will miss the final two games of the season with a torn ligament in his knee, according to a report. There's no word yet on which ligament Clay tore and thus what kind of timetable he's looking at for rehab, but suffering the injury so late in the season essentially ends his season regardless and he will likely be placed on injured reserve within the next few days. A sixth-round pick out of Tulsa in 2011, Clay has started exactly nine of 14 games played each of his first two seasons with the Dolphins. He finished his sophomore campaign with 18 catches for 212 yards and two touchdowns, highlighted by a Week 12 performance against the Seahawks in which he totaled 84 yards and a score in six receptions. The versatile 23-year-old moved all over the Dolphins' offense but was essentially the No. 2 tight end behind Anthony Fasano. The team will now look to fill the void with backup Jeron Mastrud, third-round rookie Michael Egnew and undrafted rookie Kyle Miller. Egnew, who was taken 78th overall this past April out of Missouri, struggled through training camp and the preseason and has found himself on the Dolphins' inactive list for each of the team's first 14 regular season games this season. Quite frankly, it would be a shocking and embarrassing situation if Egnew couldn't see playing time with Clay out for the remainder of the season. Miller is a 24-year-old Mount Union (D-III) alum that went undrafted in 2012 and spent camp in Jacksonville before landing on the Colts' practice squad. He was promoted in Week 11 only to be waived after the game and claimed by the Dolphins on Nov. 20. He's spent the past four weeks inactive. The Miami Dolphins' Week 15 game against the Jacksonville Jaguars went about as I would have expected. Penalties and a complete lack of talent killed the Jaguars, who looked to me like an extremely poor man's version of the Dolphins. The Dolphins didn't destroy them like a great team would have, but even with a few mistakes of their own, they had know trouble holding the Jaguars at bay. The Dolphins are an inconsistent team that's average at best, but the Jaguars are simply way worse. Ryan Tannehill was off early with a couple errant throws he should have made, including a high throw to Rishard Matthews that would've been a touchdown if he had hit him in stride. After the first quarter, however, I can't recall a bad throw made by Tannehill and he did exactly what you would expect against a bad Jaguars defense. He made all his throws in the face of no pressure and successfully bootlegged different directions on his touchdown throws. I'm still a bit jealous when I see the incredible statistical success of some of the other rookie quarterbacks, but I like Tannehill a lot and I can't wait until he has some real weapons. Reggie Bush did well, especially in the second half, and made some nice cuts that made defenders looks absolutely ridiculous. He once again was not involved much in the passing game despite the absence of Davone Bess, which is quite perplexing. Brian Hartline wasn't even targeted in this game for the longest time, but he did show up later and made some nice plays on his way to his first career 1,000-yard season. It's a nice milestone for the former fourth-rounder that has always shown good ability. I really hope the Dolphins can work out a reasonable contract with him because he could be a nice No. 2 well into the future. Marlon Moore and Rishard Matthews each made some nice plays, but it's clear they can't be consistently be relied upon. Hell, even Marcus Thigpen made a few plays out of the slot and newly-claimed Armon Binns played 10 snaps at receiver, which just goes to show how thin the Dolphins' receiving corps is when they are down Davone Bess. Another good game for Anthony Fasano, who blocked well and caught some nice passes, including his second touchdown in as many weeks. I'd really like for the Dolphins to be able to work out a deal with him to bring him back as the No. 2 tight end. It's hard to really grade the offensive line here because the Jaguars' pass rush is just so bad. The team predictably didn't have any trouble despite the recent shakeups at offensive tackle. John Jerry even got dinged up and allowed Josh Samuda to see his first action at right guard. I wasn't thrilled with the run blocking, which wasn't that great and Bush's 104-yard day is misleading with one 53-yard run. The run defense wasn't as good as I thought it would be, although the Jaguars had to abandon the running game and put the game on Chad Henne's shoulders, which obviously didn't go well. But I felt like this unit should have stuffed the Jaguars' no-name running backs. On the plus side, the pass rush was there and Cameron Wake had another great game despite being stuck with 14 sacks on the year. Wake was credited with five hurries and a hit, plus drew a couple of key holding penalties. Jared Odrick notched a sack from the inside, which is where he should be playing anyway. The linebackers had a great game in this one, including self-proclaimed hall of famer and guy-that-I-hate Karlos Dansby. Jason Trusnik is a big drop-off in the starting lineup, but he did have a nice tackle on a 4th-and-1 play. I swear, I am so tired of watching Sean Smith play. He was slapped with a questionable pass interference call (though I expected the flag) and he gives up easy catches way too often while celebrating on incompletions he had no part in causing. I was pleasantly surprised with the way Bryan McCann played late in the game and I'd like to see more of him if Nolan Carroll misses time with a knee injury. Chris Clemons had one of his better games yesterday in a rare outshining of Reshad Jones, who has played like a Pro Bowler for most of the season. I'd love a playmaker back there but these guys are at least serviceable. I think it's safe to say any concerns about Dan Carpenter should be sufficiently put to rest. Carpenter nailed another 53-yarder yesterday on his way to a perfect 3-for-3 day. He's missed just one field goal attempt since Week 5 and is back to his old reliable self. The Miami Dolphins' receiving corps has been the most criticized unit on the this this season, and for good reason. The Dolphins' loss to the 49ers yesterday highlighted the offense's lack of playmakers and the need for a true No. 1 player at the position. While the Dolphins are unlikely to solve their receiver woes before the season ends, the team has added another body at the position. Beat writer Joe Reedy of the Cincinnati Enquirer tweeted Monday afternoon that former Bengals wide receiver Armon Binns was claimed off waivers by the Dolphins. To make room for Binn on the active roster, the Dolphins waived cornerback Michael Coe. Signed on Nov. 28 after his release from the Giants, Coe was active in Week 13 against the Patriots but did not dress yesterday in San Francisco. His release could be an indication that cornerback Jimmy Wilson (hip) is ready to return to the field. A Pasadena, Calif. native, Binns arrived at the University of Cincinnati in 2007. He became a starter as a junior in 2009, teaming with Mardy Gilyard to lead the Bearcats to a Big East championship. As a senior, Binns led the conference with 56 receptions and 1,101 yards. Despite entering the 2011 NFL Draft as a phsysical specimen (6-3, 210) that had just led his conference in receiving, concerns about his overall speed and versatility led to his going undrafted. He was initially signed by the Jacksonville Jaguars, catching two passes for 20 yards and a touchdown in the preseason before being waived. Binns was signed to the Cincinnati Bengals prior to Week 3 of the 2011 season, spending nearly all of his rookie season there before being added to the active roster for the regular season finale when Andre Caldwell landed on injured reserve. He was inactive in Week 17 as well as the team's Wild Card Playoff game at Houston. In 2012, Binns drew rave reviews in OTAs and training camp, earning a starting spot opposite A. J. Green. He opened five of the team's first six games, catching 18 passes for 210 yards and a touchdown, which came against the Redskins in Week 3. Against the Dolphins in Week 5, Binns caught four passes for 41 yards but also lost the first fumble of his career, which was forced by Koa Misi and recovered by Tony McDaniel. An ankle injury temporarily sidelined Binns in October and he was unable to regain his starting job upon return. Since Week 6, Binns has played in just two games with zero receptions in 17 offensive snaps. He was waived by the Bengals on Dec. 8. Fans shouldn't look to this move for immediate or long-term salvation of the Dolphins' passing game. Binns went undrafted for a reason and has been cut by two teams for a reason, so it's important to not get overly-excited about such an acquisition. Most likely, he won't have an impact for the team this season and if he does play it would almost certainly be on special teams. Binns has appealing size and is known to have pretty reliable hands from his time with the Bearcats. He reportedly has 4.5 speed and has excelled at out-jumping defenders for deep passes. His abilities as a complete receiver, however, are questionable and he certainly needs more time to refine his route-running. That being the case, Binns is a low-risk acquisition and worth a look from the Dolphins, who certainly don't have much to offer in the way of receiving depth the way Marlon Moore and Rishard Matthews have been playing. Binns actually entered the season as a starter with an NFL team, so it's safe to say he has at least as much ability as those two, who have combined for seven catches all season. Binns has earned his first accrued season with his time on the Bengals' active roster and is signed through 2013 at a salary of $480,000 for next season. If he survives the season in Miami as I'd expect, he'd likely return to compete in training camp. The Miami Dolphins' Week 14 loss to the San Francisco 49ers was disappointing, if not unexpected. Things went in a fairly predictable fashion. The offense struggled against an elite defense. The Dolphins' defense was on the field too long but held up fairly well, only to bend too much at the end. The Dolphins are now 5-8 on the season and are assured their fourth consecutive season without a winning record, which hasn't happened since 1966-69 when they were an expansion franchise. Calls for Jeff Ireland's head are as loud ever and frustration with not only the lack of wins but noticeable improvement is growing by the day. It was another so-so game for Ryan Tannehill. He didn't get any help from his receivers and I tend to think he trusts them too much. He made throws for big plays but Bess, Matthews and Moore really couldn't come through. I thought he showed great pocket presence and made some nice throws, including a beautiful fade to Anthony Fasano. It's so hard to tell right now what we have in Tannehill and we really won't know until he gets a lot more experience and some help around him. 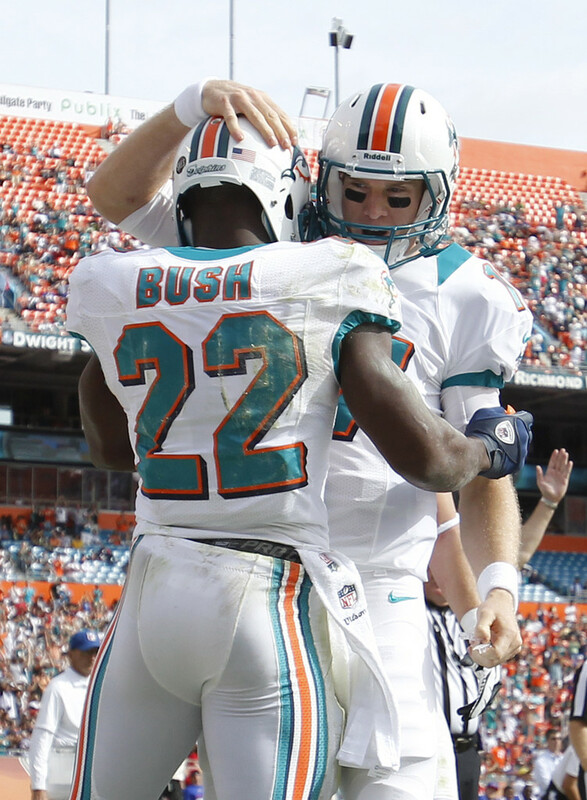 The Dolphins did a much better job of using Reggie Bush yesterday and it made a lot of difference. Bush also ran as hard as I've ever seen him so I have to give him credit for that. It's curious that Daniel Thomas saw his lowest snap total (13) of the season after spending the whole last month essentially splitting time with Bush. It's really difficult right now to get a clear picture of the Dolphins' backfield in 2013. As mentioned earlier, the Dolphins' receivers didn't give Tannehill much help in this one and it really showed yesterday how much the team lacks a true No. 1 receiver. I love Brian Hartline and Davone Bess as second and third options, but the team needs a playmaker in the worst way and that would open up more opportunities for the others. I also don't see any future for Matthews and Moore in the team's offense. Fasano's one-handed grab in the end zone on a fade route was probably his best catch as a Dolphin and showed that he is a capable receiver, even if he's not a playmaker like Jimmy Graham or Rob Gronkowski. 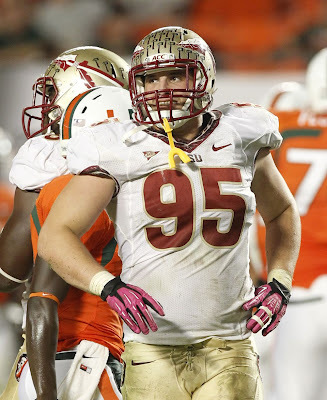 I'd love for the Dolphins to explore getting one of those types, but I'll take Fasano as my No. 2 tight end any day because he's so well-rounded. The Dolphins' pass protection, minus Jake Long and plus a new rookie left tackle, held up about as well (or not well) as you'd expect. The team allowed eight hurries, half of which were from Jonathan Martin on Tannehill's blind side. Martin was dominated by NFL sack leader Aldon Smith at times and the Dolphins' offense was hindered because it couldn't open up the playbook. Surprisingly, Nate Garner held up extremely well (or picking on Martin was just easy enough) and the run-blocking was quite good for Miami. This was one of those games (and it seems like we have them every week) where Cameron Wake looks better than the other 10 guys on the defense combined. Wake was good against the run while getting a ton of pressure (including two sacks) on Kaepernick. He's having a career year and is a lock for the Pro Bowl on what looks like a steal of a contract extension by Jeff Ireland. I will admit that Karlos Dansby made some good plays yesterday, but he also whiffed a few times and continues to be average at best. I have to believe he'll be a roster casualty in the offseason. Koa Misi continues to play well, and losing him to an ankle injury hurt he defense as Jason Trusnik was pretty exposed. Trusnik's rough day was highlighted by failing to seal the edge on Kaepernick's 50-yard touchdown run at the end of the game, and it's clear he doesn't belong on defense too much. Sean Smith seemingly allowed every pass thrown his way to be completed, although he was unfairly flagged for pass inteference in a third down slant. Still, it's an ugly trend for Smith and he really hasn't had a good game since the first half of the season. He's not playing well in a contract year and I don't know if he's losing confidence or what. Brandon Fields had another great day, with two punts landed inside the 5. Jonathan Freeny botched one of those by carrying it into the end zone for a touchback, and unfortunately that is the rule. While Freeny should have known the rule and been more careful, it certainly is a rule that doesn't make sense. The punting team can't catch a ball well away from the end zone and then run it down to the goal line for their own benefit, so why does it not work that way here? Additionally, Freeny wasn't; diving into the end zone but caught it cleanly at the three, so the logical thing is to spot the ball there. And finally, the whistle blew before Freeny stepped into the end zone, meaning the rule should not apply in this case as a player's actions after the whistle should not be considered. The Dolphins have typically used Davone Bess on punt returns near their own end zone, but perhaps on a day when the offense wasn't going to put up many points, the team understandably tried to get more spark from Marcus Thigpen. Unfortunately, Thigpen muffed a punt deep in his own territory and gave the Niners the ball in excellent field position for a score. He did redeem himself with a kickoff return across midfield, however. Nov. 1 — The New Orleans Saints re-signed wide receiver Greg Camarillo to a one-year contract. Camarillo played in 42 games (27 starts) for the Dolphins between 2007 and 2009, catching 113 passes for 1,325 yards and four touchdowns. He is perhaps best known for his 64-yard touchdown reception in overtime against the Baltimore Ravens, providing the Dolphins with their only victory of the 2007 season. On August 25, 2010, Camarillo was traded to the Minnesota Vikings in exchange for cornerback Benny Sapp. Nov. 1 — The Calgary Stampeders (CFL) transferred defensive end Chris McCoy to the injured list. McCoy was drafted by the Dolphins in the seventh round of the 2010 NFL Draft, but was waived during final cuts. He later spent a week in November 2010 on the team's practice squad. Nov. 1 — The Edmonton Eskimos (CFL) transferred offensive lineman Orrin Thompson to the injured list. A defensive tackle at Duke, Thompson was signed by the Dolphins as an undrafted free agent in 2005 and converted to the offensive line, where he spent two seasons on the practice squad. Nov. 6 — The Buffalo Bills signed wide receiver Chris Hogan to the practice squad. Hogan finished the 2011 season on the Dolphins' practice squad and made headlines in training camp after Reggie Bush dubbed him "7-Eleven" on Hard Knocks because he's "always open." However, Hogan failed to make the Dolphins' roster in 2012 and was waived during final cuts. Nov. 6 — The Arizona Rattlers (AFL) were assigned offensive lineman Derek Dennis. An undrafted free agent out of Temple in 2012, Dennis was waived on the first day of training camp. Nov. 7 — The Atlanta Falcons placed fullback Lousaka Polite on waivers. Polite started 24 games at fullback for the Dolphins between 2008 and 2010, earning a reputation as a money short-yardage back. However, he play dipped during his final season in Miami and he was released prior to the 2011 season. Nov. 7 — The Dallas Cowboys signed linebacker Gary Guyton to a one-year contract. Guyton was signed as a free agent in the 2012 offseason but failed to make the team's final roster. Nov. 7 — The Pittsburgh Steelers signed wide receiver Derek Moye to the practice squad. An undrafted wide receiver out of Penn State in 2012, Moye was waived in June prior to training camp. Nov. 8 — The Pittsburgh Power (AFL) were assigned wide receiver James Robinson. Robinson spent part of the 2009 season on the Dolphins' practice squad before being released on Nov. 4. Nov. 10 — The Dallas Cowboys placed linebacker Gary Guyton on waivers and promoted cornerback Vince Agnew from the practice squad. Agnew was signed as an undrafted free agent out of Central Michigan in 2011 and spent most of his rookie season on the team's practice squad. He was waived during final cuts in 2012. Nov. 10 — The Edmonton Eskimos (CFL) transferred running back Jerome Messam to the injured list. Messam was signed out of the CFL by the Dolphins in 2012, but was converted to fullback and failed to make the team's roster. Nov. 10 — The Saskatchewan Roughriders (CFL) transferred wide receiver Brooks Foster to the injured list. Foster spent part of the 2010 season on the Dolphins' practice squad and attended training camp with the team in 2011. Nov. 10 — The Toronto Argonauts (CFL) activated wide receiver Maurice Mann and linebacker Robert McCune from the injured list. Mann spent part of the 2004 season with the Dolphins, but did not appear in a game. McCune spent part of the 2006 season with the Dolphins but did not appear in a game. Nov. 12 — The Jacksonville Jaguars placed wide receiver Anthony Armstrong on waivers. Armstrong spent the 2008 season on the Dolphins' practice squad and attended training camp with the team in 2009. After a stint with the Redskins, Armstrong was claimed off waivers by the Dolphins prior to the 2012 season, catching three passes in five games before being released. Nov. 12 — The Saskatchewan Roughriders (CFL) removed wide receiver Phillip Livas from the practice roster. An undrafted free agent out of Louisiana Tech in 2011, Livas attended training camp with the Dolphins as a rookie and returned a punt for a touchdown in the preseason before being waived prior to the regular season. Nov. 13 — The Chicago Bears re-signed quarterback Josh McCown to a one-year contract. McCown was signed to a two-year contract in Feb. 2008, but was traded to the Carolina Panthers in August after Chad Pennington was signed. Nov. 14 — The Tampa Bay Buccaneers signed linebacker Joe Holland to the practice squad. Holland spent a week in October 2012 on the Dolphins' practice squad. Nov. 15 — The Jacksonville Jaguars signed cornerback Brandon King to the practice squad. King spent part of the 2011 season on the Dolphins' practice squad. Nov. 15 — The Chicago Rush (AFL) were assigned wide receiver Taurus Johnson. Johnson spent part of the 2009 season on the Dolphins' practice squad and was waived during the 2010 preseason. Nov. 17 — The Houston Texans placed safety Troy Nolan on waivers. Nolan was claimed off waivers from the Texans following final cuts in 2012 and played in three games for the Dolphins before being waived. Nov. 20 — The Arizona Cardinals placed linebacker Jamaal Westerman on waivers. Westerman was signed as a free agent in the 2012 offseason but failed to make the team's final roster. Nov. 20 — The New Orleans Saints placed wide receiver Greg Camarillo on waivers. Nov. 20 — The Tampa Bay Buccaneers released linebacker Joe Holland from the practice squad. Nov. 21 — The Indianapolis Colts re-signed tight end Dominique Jones to a three-year contract. Jones spent a month of the 2012 season on the Dolphins' practice squad. Nov. 26 — The Dallas Cowboys signed wide receiver Anthony Armstrong to a two-year contract. Nov. 27 — The Houston Texans signed linebacker Cameron Collins to the practice squad. Collins was signed by the Dolphins as an undrafted free agent out of Oregon State in 2012, but failed to make the team's roster. Nov. 27 — The Jacksonville Jaguars placed running back Jalen Parmele on injured reserve with a groin injury. A sixth-round pick by the Dolphins in 2008, Parmele was signed off the team's practice squad by the Baltimore Ravens in December of his rookie season. Nov. 28 — The Carolina Panthers promoted defensive tackle Frank Kearse from the practice squad. A seventh-round pick by the Dolphins in 2011, Kearse was signed off the team's practice squad by the Carolina Panthers in September of his rookie season. Nov. 28 — The Chicago Bears signed guard Derek Dennis to the practice squad. Nov. 28 — The San Diego Chargers placed safety Atari Bigby on injured reserve with a groin injury. Bigby was signed by the Dolphins as an undrafted rookie in May 2005, only to be released in July. Nov. 28 — The Tampa Bay Buccaneers re-signed linebacker Joe Holland to the practice squad. Nov. 30 — The St. Louis Rams promoted linebacker Sammy Brown from the practice squad. Brown was claimed off waivers from the Rams after final cuts in 2012 but spent just 10 days on the Dolphins' roster before being let go. The latest chapter in Jake Long's career has seen the Pro Bowl left tackle placed on injured reserve for the second straight season—this time with a torn left triceps muscle suffered in Week 13 against the New England Patriots. The only question remaining is whether or not it's Long's final chapter in Miami. Due to be an unrestricted free agent in the coming offseason, Long is coming off his least productive season to date and has seen injuries sap his talent and ability to remain on the field. Long left Sunday's game against the Patriots with what a triceps injury and tests later confirmed the severity, ending his season after a career-low 12 starts. The former No. 1 pick in the 2008 NFL Draft has four Pro Bowl selections in as many seasons and could be heading for a reputation-based fifth in 2012. After starting the first 62 games of his career without a miss, Long landed on IR with torn bicep after 14 games in 2011. In addition to shutting Long down Tuesday, the Dolphins also waived safety Anderson Russell, who spent last season on the practice squad and and the past five weeks on the active roster, playing in the last three games as a special-teamer. He could be re-signed to the practice squad if he clears waivers. To fill their two open roster spots, the Dolphins brought back two familiar faces in safety Tyrone Culver and offensive tackle Patrick Brown. Culver played 62 games for the Dolphins over the past four seasons but was released during final cuts and has been a free agent ever since. Brown, who played in all 16 games for the Vikings last season as a reserve tackle last season, spent time on the Dolphins' roster between September and November 2010, although he did not appear in a game. It was a debate many of us had been discussing all season, but with Long officially on the shelf for the remainder of the 2012 season and the final year of his rookie contract, now we can really start to sink our teeth in. The question here is what to do with Jake Long this offseason. A few years ago, Long was looking like the best tackle in the NFL, a perennial Pro Bowler who could even garner Hall of Fame consideration if he continued to produce and rack up accolades at the same rate for over a decade. The next option is a one-year contract under the franchise tag that will guarantee Long a 2013 salary of over $15 million. It's not the money that concerns me, because the Dolphins would still have roughly $30 million in cap space even with Long tagged and they aren't going to (or shouldn't) come close to spending all that this offseason anyway. Paying Long that much with the franchise tag affects Stephen Ross' wallet, but not the future of the Dolphins or their ability to build the rest of the roster. That being said, I'm not so sure I'd use the franchise tag on Long even if I could afford it, because I think cornerback Sean Smith might be more worthy of the tag. His tender will be in the $10 million range (again, perfectly manageable for one season as explained above) and the Dolphins' secondary would be in shambles if it lost Smith, as inconsistent as he has been. I haven't been a huge defender of Smith's this season, but 25-year-old, 6-foot-3 corners with tons of starting experience don't grow on trees and the team doesn't have another clear-cut starting talent on the roster. The franchise tag for Smith is entirely affordable and allows the Dolphins to delay having to completely retool its secondary for another season. And, if Smith gets his head on straight and proves he can be a shutdown guy, then you still have the opportunity to extend him in 2014. The reality is that extending someone with Long's injury history probably isn't worth the risk, but some NFL team in need of pass protection will do it. And for all we know, Long could make it completely worth it because he has all the talent in the world. But is it worth it for the Dolphins to risk losing Smith or risk being committed to Long over six or even years? I'd say almost certainly not. With Long out for the season, rookie second-rounder Jonathan Martin will move from right tackle to left tackle and start in his place protecting Ryan Tannehill's blind side. Martin, who was a full-time left tackle at Stanford, was has had his ups and downs in 2012 but looked at home on the left side against the Patriots and projects as the long-term starter there if Long does not return. The immediate concern for the Dolphins, and Tannehill in particular, is Nate Garner starting in the right side with Martin now at left tackle. Garner held his own against New England but has struggled when thrust into a starting job in recent years, including a 2011 contest against the Eagles in which he allowed seven hurries and three sacks. The positive with Garner is that he's a fairly capable run blocker, but doesn't expect him to be entirely reliable in pass protection on the right side. The team will also miss his depth on the bench as he has NFL experience at every offensive line position. As things stand, the Dolphins really have no backup guards in the active roster and only undrafted rookie Chandler Burden on the practice squad. An Illinois native, Brown started at left tackle as a true freshman for the UCF Knights and went on to start all 50 contests for the team over four seasons, twice earning an All-Conference USA selection. Brown went undrafted in the 2009 NFL Draft and signed with the Panthers as a rookie free agent. He was waived by the team during final cuts and signed to the practice squad of the New England Patriots the following day, but was released on Sept. 24. He was signed to the Minnesota Vikings' practice squad five days later and remained there the rest of the 2009 season. Inked to a future contract with the Vikings in 2010, Brown appeared in all four of Minnesota' preseason games; however, he was once again waived during final cuts. The New York Jets claimed Brown off waivers prior to the 2010 season and he spent the first two games of the regular season inactive. He was waive on Sept. 23 and claimed by the Dolphins just days before a matchup with the Jets. After seven weeks inactive for the Dolphins, Brown was again waived and finished out the season back in Minnesota. For the first time in his career, Brown made a team's active roster to start the season and went on to appear in all 16 games for the Vikings in a reserve capacity, played 42 offensive snaps at tackle during the season. However, he was waived during final cuts again in 2012 and has been a free agent since. Brown's No. 66, which he wore for the Dolphins in 2010, is currently taken by practice squad defensive tackle Chas Alecxih. He has experience at left and right tackle and will serve as additional depth in practice with Nate Garner inserted into the starting lineup on the right side. A Fresno State alum, Culver was originally drafted by the Green Bay Packers in the sixth round of the 2006 NFL Draft. After two seasons in Green Bay, Culver made his way down to Miami and was an integral piece of the Dolphins' secondary depth over the past four seasons. Between 2008 and 2011, Culver played in 62 games (missing only two) and started six contests, including four in 2011 in place of an injured Chris Clemons. During that four-year span, Culver racked up 96 tackles, one sack, one forced fumble, two fumble recoveries, two interceptions and nine pass deflections. Culver inked a contract extension with the Dolphins in 2011 and was originally set to make $800,000 this season before he was released. He likely signed a one-year contract for the veteran minimum with the Dolphins this time around. This is a signing I like a lot, even though it isn't going to have a huge impact on the remainder of the season. Culver was at times a reliable dime back for the Dolphins and he knows the team's personnel as well as Kevin Coyle's scheme from his time with the team in training camp. I'd expect him to play as early as this week against San Francisco on special teams and maybe even a bit on defense. Like Brown, Culver's former jersey number is currently taken by another player on the team. Safety Jonathon Amaya is wearing Culver's old No. 29, although Amaya originally wore No. 40 with the Dolphins in 2010 and that was the number of waived safety Anderson Russell. I thought the Dolphins had this one in the bag. After all, the Dolphins came into today's contest 1-0 in December games against the Patriots when my dad and I have been in attendance. That has to mean something, doesn't it? Not to mention, this Dolphins team is way more talented than than 2004 squad. Alas, it was not to be as the Dolphins fell to the Patriots 23-16. Miami is now 5-7 on the season and the playoffs aren't happening. They'll have a tough cross-country trip out to San Francisco in Week 14 before returning home for winnable games against the Jaguars and Bills. Ryan Tannehill really wasn't at his best today, completing less than half of his passes. He wasn't on-point with regularity and he missed a couple throws to Hartline that could have been huge. The first one probably got caught in the wind that was fiercely at his back. Credit Brian Hartline for burning the defensive backs on those throws and Tannehill for seeing it, but an elite quarterback hits him. I do like that Tannehill is using his legs more on roll-outs and scrambles, and I loved his toughness diving for a first down late in the game and taking a vicious hit. Unlike recent weeks, Reggie Bush was actually the superior back and did the most with what he was given on plays where the line made its blocks. Daniel Thomas nearly gave the ball away on a fumble and didn't have many good plays, although his conversion on 4th-and-1 was nice, as was his spin out of a tackle on a pass before Tannehill scored later on that drive. Seeing that expletive Wes Welker do what he always does makes me wonder why the Dolphins can't use Davone Bess the same way. Bess is every bit as good as Welker but the Dolphins really don't use him as much or the exact same way. Bess is too often running deeper routes and a playmaker he is not. Perhaps it's the fact that the Dolphins' lack of talent on offense forces him into another role, because I think on a better team he'd be an even bigger mover of the chains than he is in Miami. A fairly invisible day for the Dolphins' tight ends, a week after Charles Clay went off for 84 yards and a score. I wonder if Clay will ever be more than a bit player in the Dolphins' offense. It looks like Jake Long may be done for the season with a triceps injury, and as cruel as it sounds, that may actually be a blessing in disguise for the Dolphins. Long's drop-off in performance has already made me against giving him Joe Thomas money, but I'm not even sure I can justify the franchise tag at this point. The Dolphins may be better off seeing what Jonathan Martin can do back at his old college spot of left tackle for the rest of he year. Speaking of Martin, I thought he held up very well today considering he hasn't worked at left tackle since he arrived in Miami. Martin's had a very rocky rookie season but he's obviously a better schematic fit than some of his teammates so it could be good for him to get a head start on his potential 2013 position. My only concern this year in losing Long is the right tackle spot with Martin on the left side. Nate Garner used to be a useful backup but recent history has shown he just doesn't have what it takes to start in this league. I don't see John Jerry being a good fit outside and I'm curious if converted tight end Will Yeatman could be given a look. Cameron Wake had another great game and he terrorized Tom Brady like he has in the past. This controversy about him being on the sideline late in the game is an interesting one, because while stopping the run is not necessarily his forte, he's not a huge liability there either and he's certainly the best athlete and top overall talent in that unit. The fact that Wake seems visibly upset is also concerning because he's really not one to cause problems. I hope Joe Philbin and the coaching staff figure out how to smooth this over, even if Wake is locked up long-term. Kevin Burnett had another strong game and has easily been the most productive linebacker on the team this season. Koa Misi actually had a sack as well, but that could have been an optical illusion as it was sunny and raining at times in the stadium. I guess what I'm trying to say is, Misi sacking the quarterback (you know, what we drafted him for?) is like seeing a rainbow. I heard one fan at the game scream, "Make the tackle, Dansby!" and another say, "He can't, he only has one arm," referring to his torn triceps. My question is, if Karlos Dansby can't make the tackle, because of injury or whatever, why is he out there at all? He's having a sub-par season, to put it kindly. Watching him try to guard Aaron Hernandez and Wes Welker was laughable. 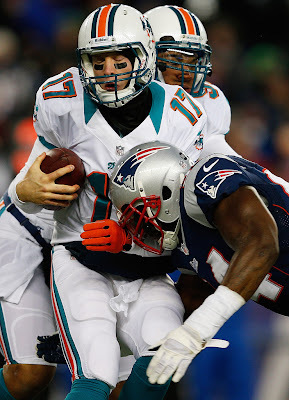 Reshad Jones had a tremendous game, with a highlight reel interception and a nice sack on Brady. The former fifth-round pick is having a breakout season and has become one of Jeff Ireland's best mid-round selections. Jones is having a career year with new highs in tackles, interceptions and forced fumbles and he's only worth a lot of consideration for an AFC Pro Bowl spot. Good to see Dan Carpenter continue rolling after a rocky start to the season. He nailed all three kicks today in wind that didn't make anything a gimme. I can't really be mad at John Denney or Brandon Fields for the botched punt early in the game. It had just been raining for about 10 minutes before the play so I'm sure the field was wet, and those guys are usually perfect at their jobs. The snap wasn't good and Field made the right call to eat it when he couldn't handle it cleanly on his first attempt to pick it up. It was a big play that really could have ended up changing the game, but these guys are so good it's hard to get mad at their rare mistakes.